The Mimi Costa Realty project was a project of collaboration, discovery and execution. This particular client was looking for a complete brand refresh and a way to automate their marketing process. Our team helped to identify their target market, create a plan to address the needs of this demographic and put a plan into place for execution. Our team began by creating a brand identity that targeted millennials in the Northern California/Bay Area territories. We placed particular focus on creating a mobile tool that their clients could use to stay connected with them. This tool was created to be used as a quick reference for clients. It allows users to search nearby open houses, featured listings, neighborhood stats and connect directly to the realtor all at the click of a button. 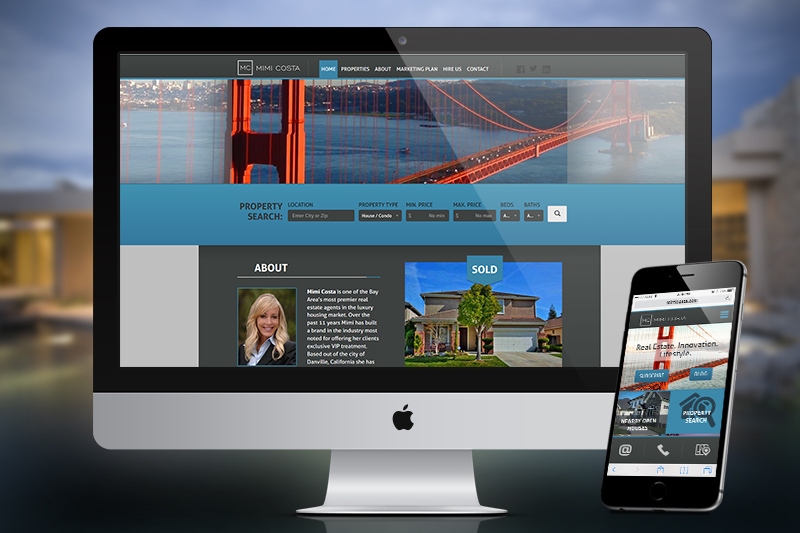 We further created a separate UX for the desktop site that fit a more traditional realtor site allowing for a more custom search and extended information. What makes the site unique is the thoughtfulness that went into the flow of information including the marketing strategy. The overall results increased traffic through their site resulting in additional lead conversion.